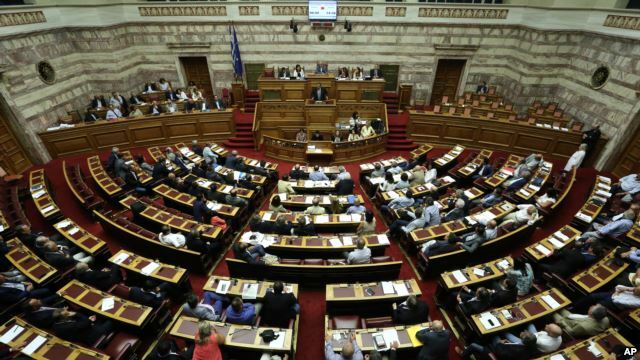 Greek lawmakers have approved a $93-billion bailout package from the European Union, just hours ahead of a meeting by eurozone finance ministers to debate the measure. Unable to borrow on the international markets, another bailout is all that stands between Greece and a disorderly default on its debts that could see it forced out of Europe's joint currency. The vote was passed with 222 votes in favor, 64 against, 11 abstentions and three absent in the 300-member parliament. In a speech to parliament late in the all-night legislative session ahead of the vote, Greek Prime Minister Alexis Tsipras told lawmakers that the bailout package is a "necessary choice" for the nation, despite unwelcome tax hikes and spending cuts. Tsipras said Germany, and in particular its finance minister, Wolfgang Schaeuble, was attempting to undermine Greece and its position in Europe's joint currency, and would rather see Greece kicked out of the euro. The prime minister was forced to rely on support from the opposition party to get the measure passed, despite numerous procedural delays in the debate that began Thursday morning. Tsipras faced strong opposition from his own Syriza party, including a movement by more than 10 left-wing politicians to create an anti-bailout movement. Eurozone finance ministers are set to meet later Friday to make their own up-or-down vote on the bailout agreement. The deal will also need approval from the parliaments of several other countries, including that of Greece's harshest critic, Germany, before any funds can be disbursed. Some nations, such as Finland, have already given their approval. The deal was settled this week with international creditors - the European Central Bank, European Commission and International Monetary Fund. It imposes harsh new spending cuts and tax increases in exchange for new loans. The new funds will enable Athens to make a payment on its debt to the European Central Bank later this month. Greece needs the money by August 20 when it must repay about $3.5 billion in debt to the European Central Bank. Finance Minister Tsakalotos has insisted Greece does not want an interim loan, which some creditors have proposed as a solution if the main bailout deal cannot be finalized with all creditors in time. However, senior EU finance officials overnight tasked the European Commission with drawing up a “contingency plan” for a new interim loan as a safety net, said an EU official who was not permitted to speak on the record due to departmental rules. Such a loan would take care of Greece's Aug. 20 debt payment and buy more time for eurozone members to tweak the plan. Germany has so far maintained a cautious stance. German deputy finance minister Jens Spahn on Thursday stressed the importance to Germany of getting a clear signal from the International Monetary Fund, which participated in Greece's two previous bailout, that it will remain a part of the rescue program. The IMF, however, insists Greece needs debt relief of some sort as it calculates the country's debt, currently at 180 percent of GDP, is unsustainable. “We look forward to working with the authorities to develop their program in more detail and for Greece's European partners to make decisions on debt relief that will allow Greece's debt to become sustainable,” said Delia Velculescu, the IMF's negotiator on Greece in this round of bailout talks. The IMF “will make an assessment of its participation in providing any additional financing to Greece once the steps on the authorities' program and debt relief have been taken, expected at the time of the first review” of the third bailout, which would occur three months after it begins. Greece has been in financial turmoil for more than five years and had already received two bailouts when it came dangerously close to defaulting on its debts in June. While Athens managed to eke out a new bailout agreement with the European Union, the deal is forcing the government to impose new austerity measures deeply opposed by Prime Minister Tsipras and many Greek citizens. Critics say Greek citizens already have endured enough financial constraint. They argue that the austerity measures will further damage Greece's ailing economy. The government has taken several steps to try to halt the financial crisis, including closing the stock exchange for more than a month, shutting banks for three weeks and instituting limits on the amount of money Greeks could withdraw.